I cringe at attending large social gatherings. I abhor the group think mentality of pep rallies or the over-enthusiastic speaker who insists we answer their rhetorical questions with exuberant unison. I need silence and solitude to read and write. I avoid loud debates; whether in person or online. I simmer inwardly when an over-confident, smooth talker monopolizes a meeting. I love my lively clan of a family, but need to retreat to my room to replenish my energy. I think I might be an introvert! Now I have found an ally who has intelligently and insightfully put into words the story of being an introvert in an increasingly extroverted world. 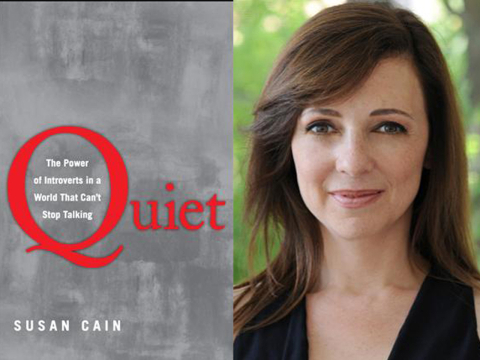 I’m only in the middle of Susan Cain’s fabulous book, Quiet: the Power of Introverts in a World That Can’t Stop Talking, but have already gleaned much wisdom and understanding from it. Cain has written a very readable book, filled with solid research, exploring how the culture in the U.S.A. changed from a focus on character to personality. From Dale Carnegie’s How to Win Friends and Influence People to Unleashing the Power Within with Tony Robbin’s, we are told that success is equated with being able to convince others to buy what we are selling (whether it’s products, ideas or ourselves) and to do so with over-the-top confidence and bravado. From corporate board rooms to church pews, the focus is too often on presentation and not substance. The glory of the disposition that stops to consider the stimuli rather than rushing to engage with them is its long association with intellectual and artistic achievement. Neither E=mc2 nor Paradise Lost was dashed off by a party animal. Of course our world needs the gifts of both introverts and extraverts. It’s not a matter of either or, but of both and. But this book is an affirmation for those of us who have ever felt drowned out by the extroverted world we live in. Hi Isabella. Oh,,,I can really realte to this! Many people are surprised when they hear me say I’m introverted…but I, too, am not fond of crowds. I’ve learned to be “out there”because of my career, but I am really the rational, quiet thinker. I also learned if I don’t speak up on occassion that my viewpoint might never be heard. It’s a challenge when the world wants to be boisterous and I wish to be still. As you;ve stated…there is a place for all of us! Thanks! You go that right , sister! God bless.